More than 800 vacancies are open for recruitment in SSC, State Public Service Commissions, State Level SSCs and High Courts. 10+2 pass and graduate candidates, who wish to join govt sector should definitely apply for these jobs before the recruitment process expires. As a prospective govt job aspirant, you should not miss sending applications for clerk and stenographer recruitment. Why should you apply for Clerk and Steno posts? Secure govt job even after intermediates. Not much is needed to describe about the importance and benefits of a govt job. So, why miss a chance when you can join it too early and with a basic educational qualification? Attractive perks and allowances. With the implementation of 7th Pay Commission , the starting salary of a government servant has become Rs 18000! 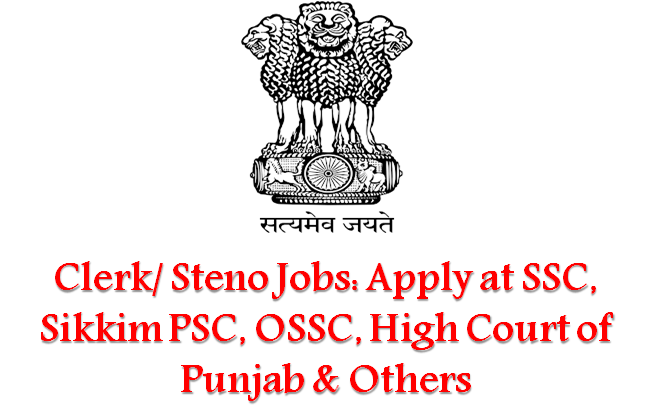 Staff Selection Commission has officially called applications for Stenographer Grade C and D recruitment. 10+2 pass outs can apply till 15 July 2017. Odisha Staff Selection Commission (OSSC) has announced of 423 vacancies in junior stenographer, junior assistant and clerk posts. Likewise High Court of Punjab has also declared for Clerical recruitment. Candidates should note that, each and every detail about the recruitment process is given in the links below. One should go through the information carefully and make sure that application is submitted without any factual error.